Successful enterprises must master challenges such as rush orders and rapid changes in suppliers and personnel in order to secure and enhance their market position. A professional scheduling tool lets you handle the challenges efficiently. 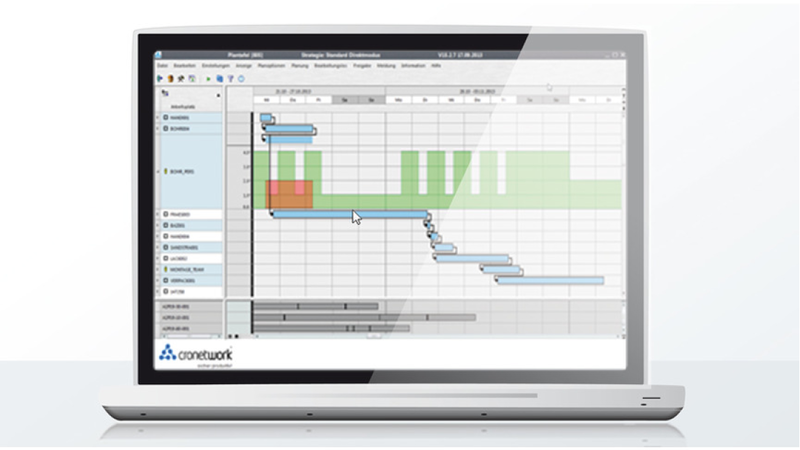 cronetwork Scheduling Board is a flexible tool that lets you transfer production orders from the ERP system and schedule them on available capacities. The computed scheduling scenario is presented visually so that interactions and effects on other orders are immediately seen. The clearly understandable Scheduling Board helps you to detect and utilize available optimization potential in your production. You improve your delivery reliability, reduce throughput times, optimize setup times and minimize stock levels. You can master even highly complex scheduling tasks with our effective scheduling tool and with optimized costs.